Built it. Not currently working. I used 3.9n caps instead of 3.3n, and had to make a resistor that is 3.02K instead of 3K. Would these cause it to not work? The 3n9 and 3.02K wouldn't make a difference, the cap is in the tone stack so even if it slightly changed the response, it wouldn't stop it working. And the difference between a 3K and 3.02K is so irrelevant that normal tolerances of the same resistor would normally show more of a difference. I've been over it a couple of times and am fairly confident it matches the schematic. What IC have you used, and are you sure the schematic is verified? I am not the one who provided the schematic, so I have no idea if it is verified or not. Tried it with both a TL062 and a JRC 4559 with no luck. Sorry Will, I thought it was you who requested it because you built it straight away. So many requests so I can't remember who asked for what! :o) I'll check it over again later and try to check if the schematic is verified. Mark you are doing awesome work. Hopefully you aren't feeling too swamped! Not sure what the significance of these values are, but if you see something wacky let me know. Found a tiny solder bridge between IC pins 5 and 6 when I went to take a pic, works perfectly now. Thanks for all your trouble Mark. Consider this one verified! Good stuff, thanks for that Will. it was me that i requested this.....thanks a lot to Mark for the quick response! hey will how it sounds?is it closed to the original mxr micro amp? I built it into a box with a SHO, so I can't hear what it sounds like by itself, but it does seem to have the same character as my normal Micro Amp. The tone stack is surprisingly effective in my opinion. This is a cool design. Yes there's a few things I like about it. The tone stack is basically a big muff, but I really like that gain control which is different from the original Micro Amp. It adds gain in the clockwise position, and is a unity gain buffer/voltage follower in the counter clockwise position. You're going to have to go over it with a fine tooth comb and look for burr or solder bridges etc. It certainly seems that Will verified the layout, which means there's a problem with the build or a component. If you're still struggling then post a front and back pic of the board. heres my go on this one, took a chance and boxed it before i even tried the board and worked right off! went with JRC4558. graphics inspired by the movie Lawless and it's soundtrack, a really good soundtrack btw! I changed the 1m on input to 10m...fixed...was that a fluke lol ?? Try something smaller for the output. Usually 220K works the best for output pulldown. Try a low value resistor like 1K in series with the input wire. Thanks guys will give it a go and report back, I think i got my theory wrong as a larger resistor would have made the pop worse ? By series I mean take the disconnected input wire to one end of the resistor, and take the other end to where the input wire is supposed to connect to the board. That is Jack Deville's anti-pop method by using a current limiting resistor directly in the signal path at the input. Using that low value resistor as a pulldown will always kill the signal because the resistance is so low that much of the signal is being immediately dumped to ground. In answer to your question before, 10M shouldn't really make it worse but it definitely won't make it better. The pulldown resistor creates a path to ground for any leakage from the input capacitor, and so increasing the value puts more of an obstacle in the way, which might not be detrimental, but will definitely not be better. Personally I wouldn't use more than a 1M for a pulldown. Yup. Slowing the input with a "small" value resistor in series is one way to try taming the input pop. It seems that most (schaller trem, duncan pickup booster, etc.) the problem isn't with the input - but with the output popping on the switch. This seems quite common with designs that don't have output coming from the volume pot but from the output cap itself. So 220K from ground to output. That should fix any of those without hurting the output level. I have the same issue with the AC Booster. Huge bassy pop on activating and deactivating. I've tried all the above and nothing is shifting it. Shame as it renders it unusable for me. Built it today with TL062 and sounds great. Tone control is really miraculous, from thick strong sound to ringing bright tone..
Could use some help on this one... It works but not right. Volume is significantly lower than when bypassed and only gets to about unity at the top of the sweep. Tone doesn't do mush at all until the last 10% where it introduces a muddy distortion. I've reflowed the joints, scraped for solder bridges, replaced a couple suspect parts, swapped out the IC. photos were just made public... sorry. jerry!!! found your problem mate! !under your ic the top link is at the wrong hole!!! Yup there it is... I feel a little stupid, but then again the stupid mistakes are easier to find right? Thanks everyone! Fixed and working great... I also found a solder bridge down by the connection for tone 2 that has messing with that part of the circuit. I had scraped it before but it was a stubborn enough blob that I had to gouge at it for a while to clear completely. Anyone else find the Tayda veto boards to be a bit fussier to work with? My first board was from Mammoth and it flowed a lot more cleanly. The solder seemed to want to bond easier... Fwiw. Sometimes I look at some of my older layouts and there's something about some of them that I really hate, so I've been updating them when I come across them. With this one it's the stupid huge span radial electrolytic. So I've updated it and made it a column smaller if you want to build the latest one. All connections remain the same so it will also be good to go. could i take a NE5534? Nope. That's a single opamp and this layout needs a dual. Single opamps have a different pinout. All (well most) of these layouts call for a AC to DC supply only! If you gave this circuit AC that explains the blown cap...and way well have harmed the IC too. Wonderful..i use this adapt with all my other (non-diy) pedal and was good..i tried then with a 9v battery, i get no sound, only when i play "harder" i hear a far distortion..is the ic harmed previously on ac courrent? Thanks! How comes that this one uses a 100k lin pot for the gain and the normal one uses a 500k inverse log pot? TL061 is a single opamp with completely different pinout. 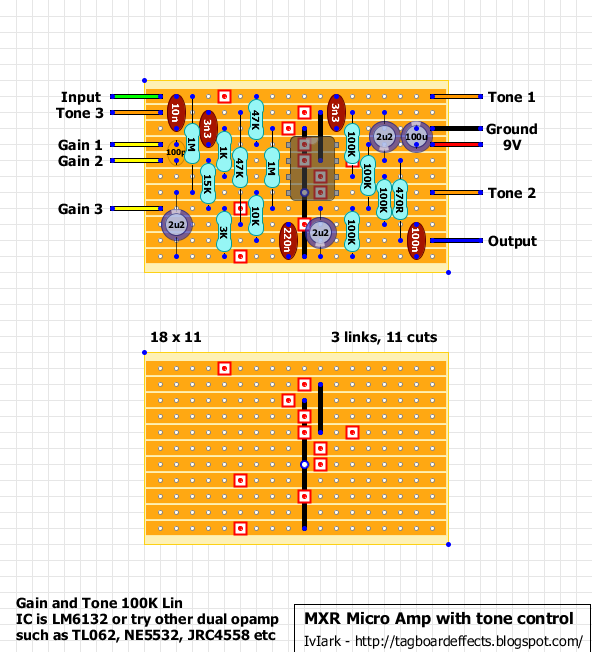 This layout is for Dual opamp (with two channels). So it wont' work at all with TL061. You'll need TL062, TO072, TL082, JRC4558, NE5322 or similar. Thankyou! I have a TL062 now, but still nothing works! I Have been getting some pretty stranger results though, I get a strange bleeping noise (Very high pitched) when I connect the circuit to an amplifier, why might this be?? That could be caused by a short circuit - which could be result of an unwanted solder bridge between board strips. Next, you should run a sharp knife between the strips and triple check all the cuts. Use a magnifying glass, that'll com in handy here. You should have around 4,5V (+/- 10-20%) at pins 1, 2, 3, 5, 6 and 7. Pin 8 should be at supply voltage. If one of those is completely off, then there is something wrong with components connected to that pin. I can promise, you'll feel like a king once you solve it. And you eventually will. Also, if you placed the circuit inside an enclosure already, there is a chance the short could be at the switch. And by the way - the high pitch squeeling is called oscillation. Which usually happens when signal is fed back to the input of the circuit too loud. Some pedals oscillate as a feature - but obviously not this one. The gain completely at CCW (counter clockwise), there will be asignal passing through. If you want it to be silent, you could add a 100K linear pot as master volume (take the output to lug 3, lug 1 to ground and lug 2 is your new output. IC orinetation matters a lot. Note the little "u" -like detent on the top. Left of that is the pin number 1. I strongly recommend aqcuiring a DMM (digital multimeter). Since you are a electric instrument player, you'll be needing one along the way anyway. You'll want an automatic basic meter with decent/good value. Maybe something like this: http://www.ebay.com/itm/311177607324 - Sure enough, that's not a blue Fluke, but it'll last you a long time while still being quite cheap. I use the previous model and it's been my bench meter for.. dear god.. At least four years now. Ooh man, i confuse haha, thanks again my hero!